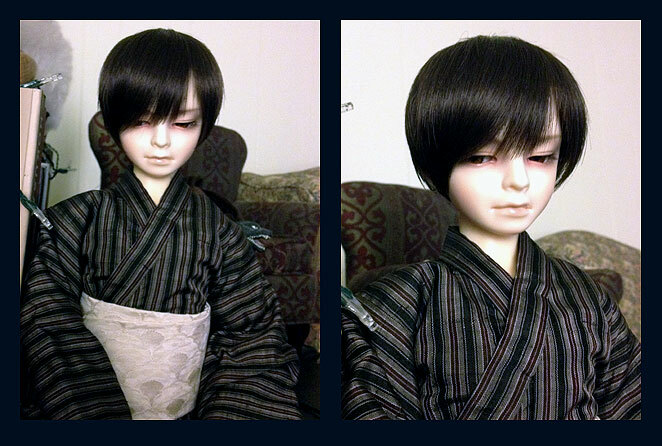 Right now he is shamelessly borrowing Hito’s body for these photos (so weird seeing Hito’s floating head;A;). So I’m saving up for a particular body. 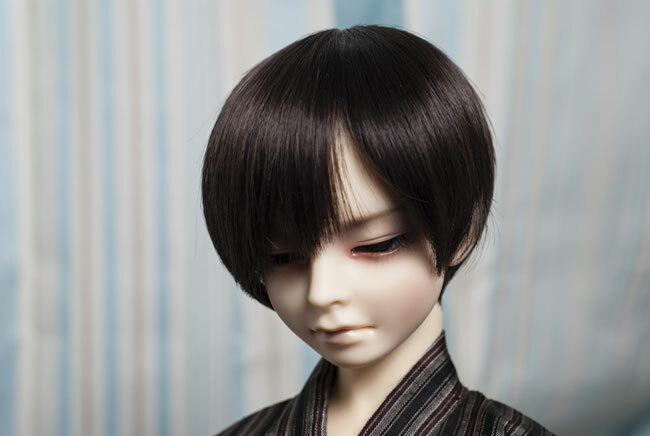 Due to the price and demand of the body I want to get, I was thinking of getting him a sub in the mean time until I had the funds. But I think I’m just going to wait and go all the way. He also needs a good pair of eyes. I absolutely hate the ones that are in him now. They are just a junk pair I had laying around in my eye stash but they are the only pair that work for the moment (though I’m going through my eyes again this afternoon… hate these). The wig also needs a tiny bit of a trim… maybe. Slowly his look will come together. By the way, he’s wearing a kimono that level_devil made for Aki a few years back (h1545h1 to you lj folks, muffin on doa). I love this piece and Aki does not wear it enough. For now Mr Head is taking it over (though it’s a bit long on Hito’s shorty body, hahaha). Mr Head is going to be needing a rather large wardrobe full of kimono, yukata and haori. Oh, and as for names (because as funny as “Mr Head” is, he’s not keeping it) I’m think of Daisuke or Tatsuya. I’m waiting for him to get a bit more completed before I decide. The other name I decide to not use will go to Mr Z once I get him together. Here is lovely photo taken by the Mr. And a silly comparison photo of Mr Head and Aki taken for instagram (omg how different they look… despite being the same sculpt, just different skin tones). *Warning: silly doll background story time* Mr Head is suppose to be Aki’s great uncle from the early post war Japan period(1949-1950 to be exact). Aki did not get his height from that side of the family. His uncle is such a shorty compared to him, hahaha. Anyway, Mr Head is here. I’m happy and I hope you won’t mind me spamming him as I’m getting the rest of him put together. Mr Head Preview «	| » Over Excitment Perhaps?